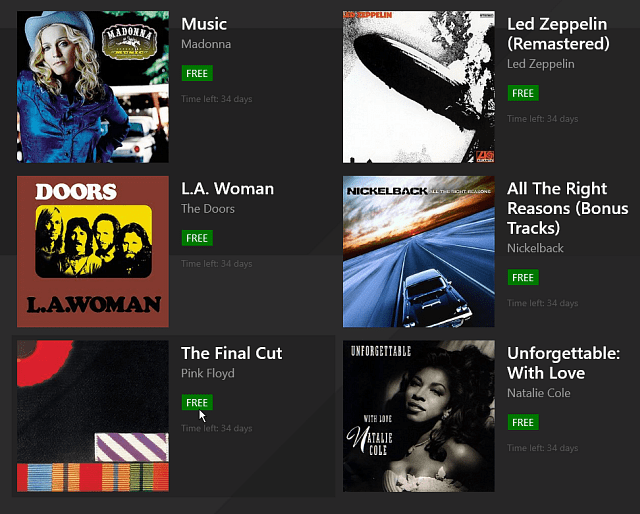 Microsoft is giving away 100 quality albums for free, and 50 digital box sets for $1.99 and you don’t need to be a Xbox Music Pass subscriber to get them. Microsoft is giving away 100 albums for approximately the next 30 days and you don’t need to be an Xbox Music subscriber to download them. 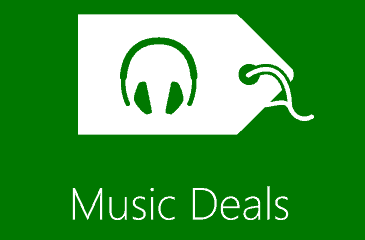 You will, however, want the Music Deals app on Windows 8 or Windows Phone which uses the Xbox Music app to get your free downloads. This promotion has several genres of music available and the album you download is high quality MP3 files. 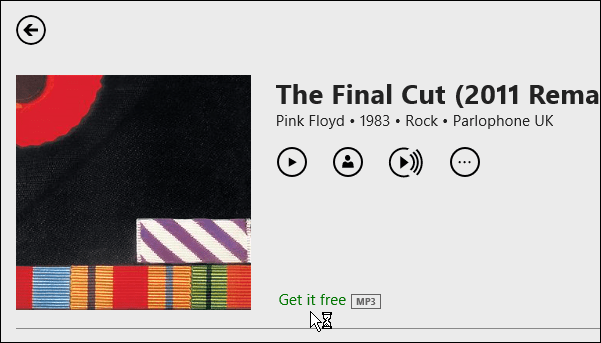 While it does use Xbox Music to download these free albums, you by no means need to use Xbox Music to play them or be a subscriber to Xbox Music Pass. The deal also includes 50 digital box sets for $1.99 a pop. And according to the Microsoft announcement, the box sets usually sell between $15 to $100. You’ll want to act quickly on the box sets, as of this writing there are only five days left on the deal. And these aren’t crappy albums you’d expect to see for $0.99 in a bin at a truck stop. I’m a rock and metal guy and for the free albums I found some quality ones from ZZ Top, Pink Floyd, Led Zeppelin, and more. The box sets have a great quality selection too. Once you have the app installed, launch it and find an album you want and click on it. Next click on the Get it for Free button. Next a message will come up asking if you want Music Deals to open Music – click Yes. 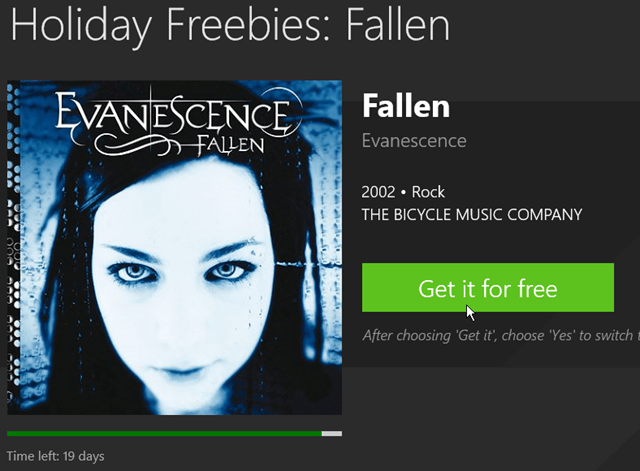 The Xbox Music app will open, and from there click the “Get it free” link next to the album cover. 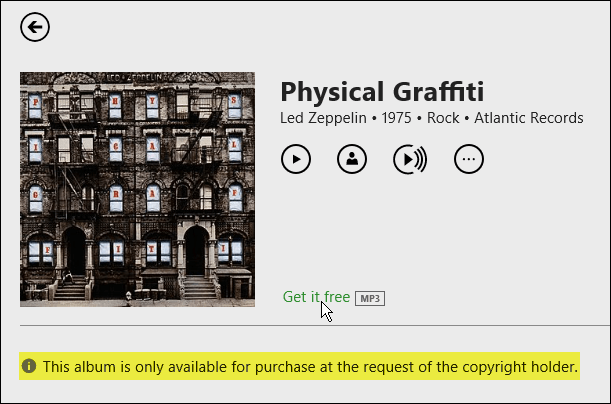 The first time I wanted to download a Led Zeppelin album, and saw the message shown below: “This album is only available for purchase at the request of the copyright holder.” That made me think I needed to be an Xbox Music subscriber – However, I was completely wrong. So, if you see that message, don’t worry , you will still get the album for free. 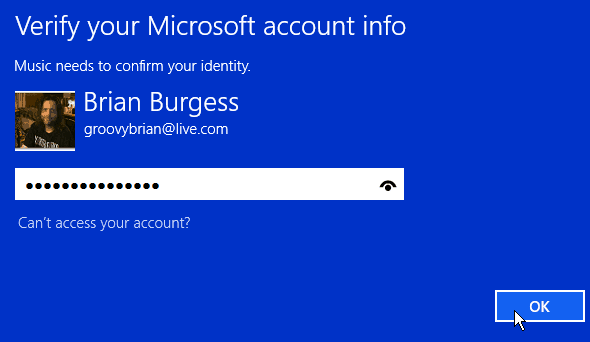 You’ll be asked to log in with your Microsoft account. Then the album you selected will be downloaded. 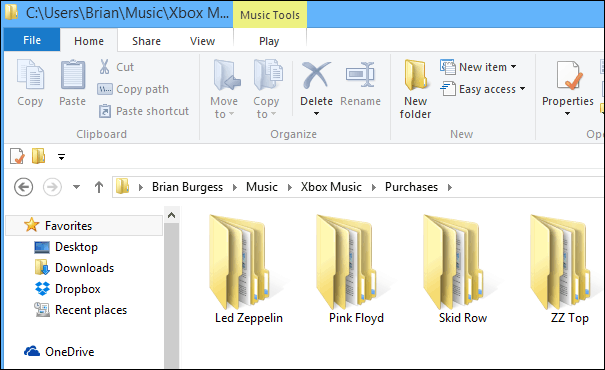 You’ll find your downloaded albums in your Music folder Xbox Music > Purchases as shown below on my Windows 8.1 system. 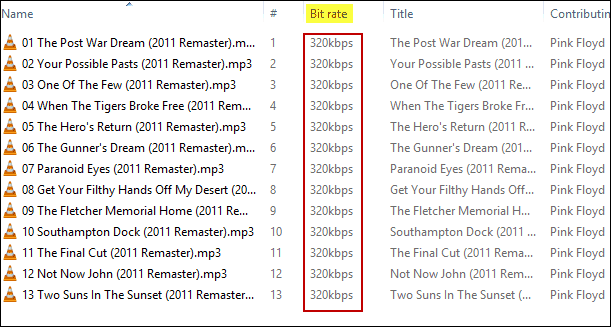 Again, notice that each of these albums is a high quality 320Kbps MP3s and once they’re downloaded you can do whatever you want with them. Put them on any device you want be it Android or iOS, stick them on an external drive, a network location…wherever. These are free with no DRM protection. For instance, here I added them to Spotify by having it scan my music folder which is an external drive – remember that after downloading the music, it’s yours to do with what you please. From what I can tell, this promotion is only available in the U.S. but if you live in another country and see the deal, definitely leave a comment and let us know. f you end up becoming an Music Pass subscriber, the albums you download from this deal will be included in your library. What’s your take? What do you think of the free album selections and $1.99 box sets? Had to tell you that your website is the only website that took the time and effort to show the entire process including the download process. I believe you are correct that this is US only. I am in Canada but my local for Windows 8 is set to US. I was able to add the individual tracks of the free albums to a collection but am unable to download any of them. After looking at your post I can see why. The Get It Free link shown in the screen shot following the “Click the Get it Free link and continue through the process…” is replaced by the price of the album! I can stream these songs for free but that is short lived since MS is turning off XBox Music free streaming capability effective Dec 1st. After that time you will need to have a paid XBox Music account. Not if your MS account has a non US region set up. If so then the tracks are only streamable for free until Dec 1/14. 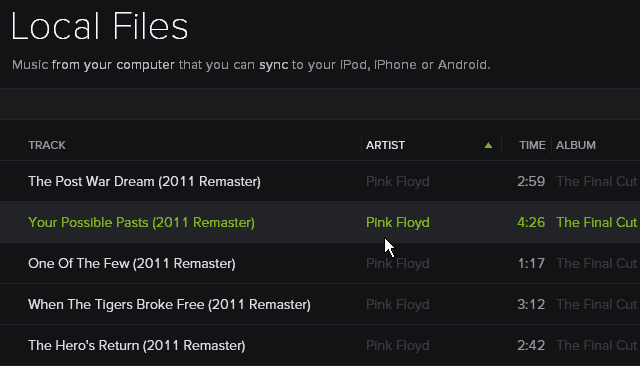 That is when MS discontinues the free XBox Music streaming and forces you to pay $10 a month in order to stream music. In other words the music I have up there will become useless. I have several albums that I got for free but can not download them. I have another MS account whose region is set to US and had no problem downloading other albums. The problem is that the albums that are streamable only are no longer available in their offer and if I attempt to change the region on my first account I will loose all the digital media aka songs. That is because the MS account has a non US region set up in it. all kinds of $1.99 albums but no free ones. I am US based. I’ve been looking all week since Joe Belfiore tweeted about this. “Approximately 30 days” must be somewhat less. I see no free albums, just 1.99 ones. And limited options each day. Uninstalled.